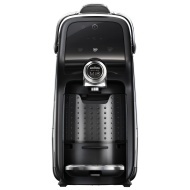 alaTest has collected and analyzed 40 reviews of AEG Magia Lavazza A MODO MIO LM6000. The average rating for this product is 4.8/5, compared to an average rating of 4.4/5 for other products in the same category for all reviews. Comments about the maintenance and capacity are on the whole positive. The size and usability are also mentioned favorably. We analyzed user and expert ratings, product age and more factors. Compared to other products in the same category the AEG Magia Lavazza A MODO MIO LM6000 is awarded an overall alaScore™ of 89/100 = Very good quality. Simple, quick, and quite delicious! I love this machine - the coffee tastes great and is quick to make. The machine is surprisingly small and easy to clean. Absolutely love it. It's a little noisy - it worries the dog. Bought this in Cardiff Store today after demo and great customer service from Angie - a credit to the store! Highly recommended.